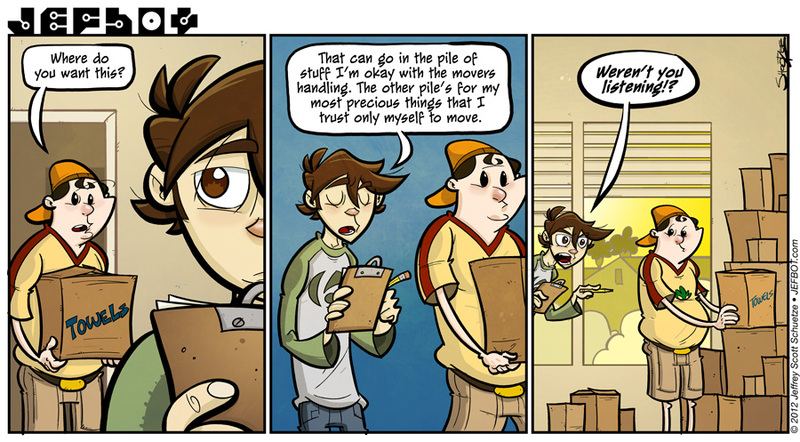 I’m kind of embarrassed to admit this strip’s pretty accurate as far as the ratio between “precious things” and “stuff-I-didn’t-mind-being-handled-by-others.” My “precious pile” grew so big at one point, that I began to wonder if hiring movers was even necessary. In the end, everything worked out, but I did create way more work for myself than I should have – work which will surely be documented in a future strip. I love reading your comic but this is my first time posting. Oh, I was so close! yes, so close, JoLee! but look how close Rinthia was, above: she must have been within seconds of getting the Shades! I can easily see you acting just like this Jeff. I’m sure I’d have a stack of “precious things” piled up to the roof if I were to move out. Stop scarying CF, he might stop showing up! protip: that “precious things” pile only grows bigger as you grow older, Nat, so try and minimize it as much as possible before you move out! Oh goodness, definitely not how i move. Well, Sort of. I wrap glass and tell people not to touch. But everything else is tossed into boxes. “Top drawer”, “Moira’s room”, “Kitchen”, “bathroom”, “nightstand”, “DO NOT OPEN IF YOU WANT TO LIVE”, “Erik’s computer parts”, that type of stuff lol and then I organize it when we get to wherever we’re going! And no one gets to help because they don’t know where anything goes? heheh. i do a lot of creative labeling too, Ky, some of which we’ll get to see in the strip! usually as the clock runs out, i’m just dumping things in boxes, though, and figure i’ll just sort it out later. it’s been over a year since i’ve moved – i’m still sorting. Oh gosh, got you beat! There’s 3 HUGE boxes of scrapbooking stuff which I’ve not touched in 4 years. It’s mainly photos. We’ve only been at the current place for 18 months…. i’m sure i have boxes whose interiors haven’t seen the light of day since my move out of the valley over 7 years ago, Ky! and photos are some of the most time consuming things – once you start going through stacks of photos, it’s hard to stop! I always started a move with clearly-labeled boxes (“towels,” “bedding/sheets,” etc. ), but then things start getting generic (“bedroom,” “bathroom,” etc.) and by the end it all just devolves down to being labeled “stuff” if at all. …come to think of it, there’s still a room in my house full of boxed-up stuff from the last time my wife ‘n I moved. Great. Now I’m self-conscious. i’ve dealt with this very thing, Joe – which most likely means we’ll see how bot deals with labeling his stuff during this move, too. i’m wishing i rented another two-bedroom apartment when i moved just so i could have a room for storing my boxes! hoping to get this tuesday’s strip up on time, too, F_F! *fingers crossed* busy getting things ready for a comic-convention i’m doing this friday! Ha, that reminds me of when my family moved several years ago. My dad took the week off and moved most of the small stuff over to our new house. That way when we called the movers all they had to move were things like our couches and beds. Then again my Dad was friends with the vice president of that moving company, so I don’t think we would’ve had to worry that much. Hope nothing bad happens to Jefbot. nice! i totally need to be friends with someone of note at a moving company, GB! i’ve moved so many times over the past couple decades or so, it’s getting ridiculous. Oops. That anonymous was me. well, bot still hasn’t found a new place yet, Striker, but since he already gave his notice to vacate, he better find one, soon! Nice comic! Read it in about a month, full of laughs. Keep up the good work. i feel your anger, ShadowShuffler! nobody touches my special stuff!!! Now I’m thinking of the M*A*S*H* episode “Hey, Look Me Over” (season 11, Ep. 1). In it, the nurses were evacuated, leaving the doctors and other male personnel to do everything. They had a very ‘inventive’ way of putting stuff together in boxes (for example ‘Purple Things’). I’m insanely good with M*A*S*H*, BtVS, Angel and Charmed trivia. Also, Harry Potter, and X-men. My bro is good with Star Wars, Stargate and M*A*S*H*. We’d be trouble on Jeopardy with those for categories. Yeah, I know this song and dance. I did all my own packing and most of my moving (I recruited a friend with a pickup truck to move my furniture), so I never had to worry about someone else breaking things in transit. But the things that had to go into storage because I moved from an apartment to a bedroom in my parents’ house…yeah, I still wake up at night sometimes, scared to death that one of the other people who have a key to the shared storage might touch my “DO NOT TOUCH IF YOU WANT TO LIVE” boxes and break something I can’t replace easily. At least I have everything seperated into “stuff I need every day” and “stuff I can live without and occasionally visit to get that warm feeling”, so I was able to focus my efforts appropriately. i don’t think i’ve done my own moving since college, T. unfortunately, i’ve accumulated too much stuff to move by myself since then, and i refuse to recruit friends to help. it’s just too crazy/big a job now. heheh. and i like how you focused your efforts during your move – bot would be wise to organize his boxes according to something as practical. It was suggested to me that it wasn’t practical to fill the moving truck with one layer of stuff at a time . . . so those boxes went in my car, except or one I forgot. Guess what I found at the bottom of a stack of book boxes? and i feel your pain: this is why i never trust moving companies with my fragile or cool stuff unless absolutely necessary. and i can’t watch them move the non-fragile stuff, either; it’s too painful to watch. Clothes sure, blankets, fine. Electronics and Books. NOPE. this is a good rule, dj. I don’t know if this was intended but what a GREAT Hitchhiker’s Guide to the Galaxy reference! Always know where your towel is and don’t panic! heh. it certainly wasn’t a conscious reference to Hitchhiker’s Guide, Lizzy040, but i’ll take it (since i love those books)! if things go wrong, at least bot will know where his towels are – though he should really keep at least one on him. heheh. Well, with your inclination to hoardnig, im not surprised at all. This also hits close to home. I am not ok with just anyone touching my stuff. I have literally had anxiety attacks over it. Which is why i usually don’t have other people help me move. So this next time Mr. Pixie and i hit the bricks I will have to trust some people…maybe just to help with the furniture. you are wise not to trust others to handle your stuff! only badness can come of that. furniture, clothing and soft stuff – maybe – and then only sparingly, but anything breakable or valuable – FORGET IT!!! Oh Bot. You’re just a tad OCD aren’t you? only a tad, TCG. a tiny tad. an itty-bitty tad. DON’T LOOK AT ME!!! hey towels are very personal y’know, who knows where those movers’ hands have been right JB? Perhaps you should reconsider the move… LOL! Hilarious.